A humid afternoon found me not structuring the plot of a new novel as I needed to, but rather waiting for the doors to open outside the iconic Gate Picturehouse in London’s hurrying Notting Hill. 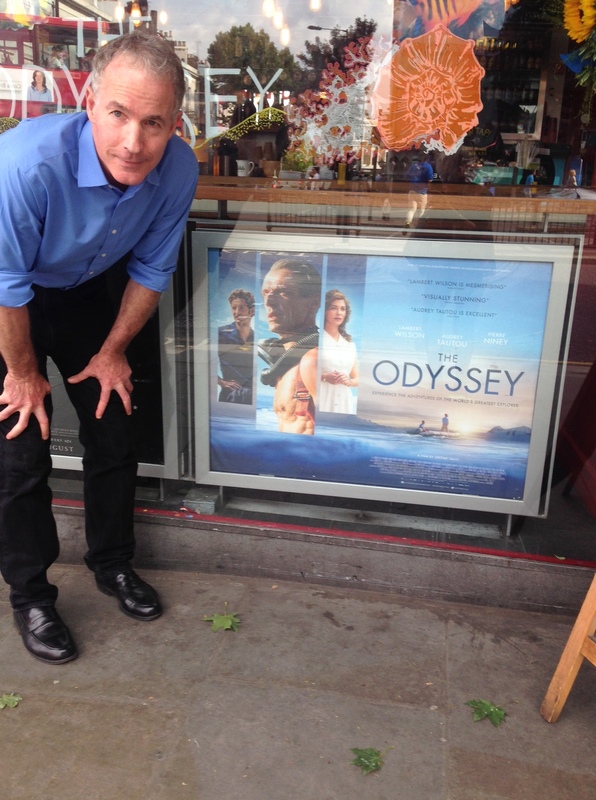 Because today they were showing The Odyssey, the biopic of the life of diver, explorer and underwater film-maker, Jacques-Yves Cousteau (1910-1997). Merriam-Webster defines an “odyssey” as a long wandering or voyage usually marked by many changes of fortune, and as much of the film took place aboard (or beneath) his creaky converted minesweeper Calypso, the title fitted like a hermit crab in a discarded shell. I hoped for glorious footage in director Jérôme Salle’s 120 minutes and I wasn’t disappointed. Whether it was the frozen monochrome of the Southern Ocean, pulsing tropical reefs, or a humpback whale and calf, it was so real that I almost felt the undulating sea grass of the Mediterranean seafloor brushing my weight belt. Beyond mere flora and fauna, what was brilliantly captured was the majestic infinity of the oceans. Equally impressive were the opening scenes where an old sea-plane danced with its shadow above a sunset ocean (in a subtle foreshadowing of later tragedy). JYC (as he was known by those close to him) was expertly played by Lambert Wilson who has a passing resemblance to the great man. We met JYC’s family, including increasingly lonely wife Simone (played by Audrey Tautou) and son Philippe. Sooner or later it had to happen and what started as a journey of discovery eventually reconfigured itself into an environmental message. Perhaps the treatment was a little overt—it felt like an after-thought—but given the state of our oceans, it was essential. I’d recommend Odyssey. It’s a film about an important man and a critical topic. ← Make-An-iPhone-Video Lecture: Lessons in Fun!